Come out, Support, and Volunteer with us this weekend for our Annual Volunteer Training! Going Strong Still. . .60 Years Long and Climbing! 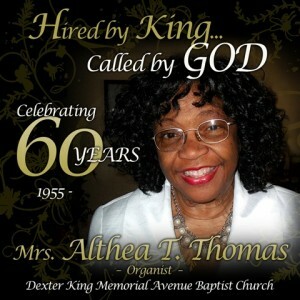 Mrs. Althea T. Thomas will be honored for her 60 years of service as Organist of Dexter King Memorial Avenue Baptist Church, where she started her playing under Reverend Dr. Martin Luther King Jr. and still plays today. WHEREAS, Althea Thompson Thomas was born in Montgomery, Alabama, the youngest of two siblings, sister Gwendolyn Thompson Ligon, to the union of H.O, Thompson and Faustine Hilliard Thompson. Her father, Mr. 0. Thompson, renown in his own right as a composer, choral director and Trombonist, exposed both Althea and Gwendolyn to piano, orchestral and Organ scores as soon as they could walk. Althea began playing the Organ and piano for churches as a pre teen and has continued to do so for more than sixty years. As a musician, organist, mentor, composer, poet, painter, scholar and author, we honor Althea on this day for her many contributions. WHEREAS, Althea is the only Organist ever hired by Martin Luther King, Jr., during his historic time as Pastor of Dexter Avenue Baptist Church, sixty years ago. She often accompanied the Late Coretta Scott King as she served as soloist, alongside her husband,Dr. Martin Luther King, Jr. Althea played the Organ through all of the civil rights’ movement. From that organ pit at Dexter, she witnessed the horror on Dr. King’s face as he received word of the Birmingham bombing, which she later commemorated in a painting and poem. From that same organ pit, she also wept at news of the untimely death of Dr. Martin Luther King,Jr, and the homegoing of the late Rosa L. Parks. WHEREAS, Althea received her Bachelor of Arts Degree, and her Master’s Degrees from Alabama State University in both Music and Art, and taught at Alabama State University, and in the Montgomery Public School System for many years. She also taught at Lomax Hannon Junior College and participated in many workshops at Alabama State University, The University of Alabama, and others. Althea Thompson Thomas has owned and operated a music studio, House of the Arts and Thompson Legacy Studio, for more than forty years which teaches Art, and Music to children and adults alike. She also sponsors the Musical and Artistic performances of her students at various venues including the Montgomery Museum of Fine Arts and Dexter Avenue King Memorial Baptist Church. WHEREAS, Althea Thompson Thomas is also a prolific composer of Music, both orchestral and choral. She has composed hundreds of piano scores for Piano pedagogy and for church celebrations. She is the author of several Bible teaching supplements and continues to write poetry and prose. She has exhibited her artwork across the county including Durham, North Carolina and Washington,D.C. Most recently, she had a show of her paintings,along with live teaching and narration at the Rosa Parks Library at Troy State University in Montgomery, Alabama. WHEREAS, Althea Thompson Thomas is the wife of Wiley Thomas, Jr.,and the mother of six children, seven grandchildren, and one great grandchild. She continues to spread her love of music through them, and in the many, many others that she teaches, daily. Music is her passion and teaching young and old to perform is her successful life’s work. We celebrate her continued commitment to the cultural Development of all people. On this 26th day of April, 2015, that this resolution be spread at length upon the journal of this day to endure a lasting record of respect and appreciation and that a suitable copy be presented to ALTHEA THOMPSON THOMAS as an expression of appreciation for all of her service to the Civil Rights Movement, her quiet courage, love of children and service to the Community and the nation. Please click the link below to see the video and full story of Aljazeera’s The Real Rosa Parks article in conjunction with the New exhibit at the Library of Congress with interview with co-founder Ms. Elaine Steele. Please see the web link below the article for the direct link to the Library of Congress website for the complete story. “‘I’d like to ask for a pay reduction.’ I said ‘I beg your pardon? Nobody’s ever asked for that before.’ Nobody’s ever asked for it since. I said, ‘A pay reduction? Rosa Parks what are you talking about?” She said ‘Well, you know how you let me go to so many places in the country and even overseas. I feel I should have a reduction and I ask you to do that.” “I said ‘Mrs. Parks, you honor me by coming to my office and having worked with me for so long.’ It was no secret that more people came to see Rosa Parks in my office than came to see me. That’s an example of the kind of person she was. 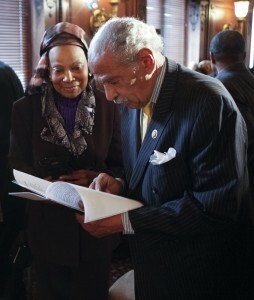 “For our government and our Library to raise her to this height makes me very, very proud of all of you,” Conyers said. The Rosa Parks Collection is on loan to the Library from the Buffett Foundation for 10 years. 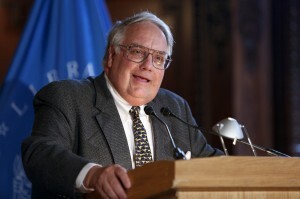 During the event, Buffett also spoke and described how he came to acquire the collection. According to Buffett, he had been watching the evening news and heard about the materials sitting in boxes in New York for 10 years. “I thought, ‘that’s crazy. How can that be right?’” he said. He told his wife that his foundation should look into buying the collection, make sure it got preserved and put it somewhere for people to see. It wasn’t until a woman from Florida – Patricia O’Toole – wrote to Buffett encouraging his foundation to buy the Parks collection and place it in good hands that he decided to act. Buffett ending his remarks by saying that he travels a lot around the world: “Everybody wants to come to America. Everybody wants to come to the United States. There is a huge reason for that. There are many, but one is freedom and that is what Rosa Parks represents – freedom.” Several items from the Rosa Parks collection are included in the Library’s ongoing major exhibition “The Civil Rights Act of 1964: A Long Struggle for Freedom,” which is open through Jan. 2, 2016. Later this year, selected collection items will be accessible online. Donna Urschel, Public Affairs Specialist in the Office of Communications, contributed to this report. “Created Equal: America’s Civil Rights Struggle” film series is back! Freedom Riders were civil rights activists who rode interstate buses. The segregated southern United States in 1961 and following years to challenge the non-enforcement of the United States Supreme Court decisions which ruled that segregated public buses were unconstitutional. The movie tells the terrifying and suspenseful story of a time when white and black volunteers riding a bus into the Deep South, risked being jailed, beaten or killed. people use to express a special gratitude. than those two words can say. “Thank you” means so much. the days so much better. just by letting you know how much you mean to me. but I’m so grateful that you did. Happy Birthday Civil Rights Activist Fred Korematsu! 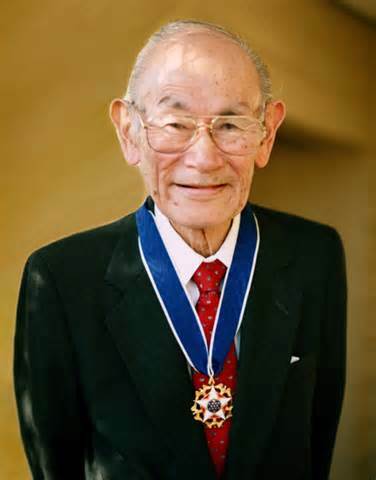 Fred Toyosaburo Korematsu (January 30, 1919 – March 30, 2005) was a Japanese-American citizens living on the West Coast of the United States at the onset of World War II. After the Japanese Navy attacked Pearl Harbor, President Roosevelt issued Executive Order 9066, authorizing the Secretary of War and his military commanders to remove all individuals of Japanese ancestry from designated “military areas” and place them in internment camps in what is known as the Japanese American internment. When such orders were issued for the West Coast, Korematsu instead became a fugitive. The legality of the internment order was upheld by the United States Supreme Court in Korematsu v. United States, but Korematsu’s conviction was overturned decades later after the disclosure of new evidence challenging the necessity of the internment, evidence which had been withheld from the courts by the U.S. government during the war. To commemorate his journey as a civil rights activist, the “Fred Korematsu Day of Civil Liberties and the Constitution” was observed for first time on January 30, 2011, by the state of California, and first such commemoration for an Asian American in the US. ^ Jump up to: a b “California Marks the First Fred Korematsu Day”. TIME. Jan 29, 2011. ^ Jump up to: a b c “Fred Korematsu Day a first for an Asian American”. San Francisco Chronicle. January 29, 2011. 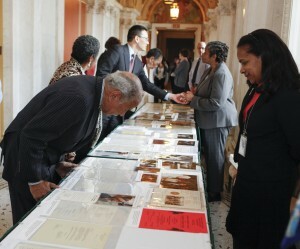 The Library of Congress, the Library of Congress Chapter of Blacks in Government and the Daniel A.P. Murray African American Culture Association of the Library of Congress will co-host a panel discussion, “Rosa Parks: Beyond the Bus,” with Elaine Steele, a longtime associate of civil rights leader Rosa Parks and co-founder of the Rosa and Raymond Parks Institute for Self Development. Joining Steele are Ella McCall Haygan, who also worked for Parks and is co-director of Pathways to Freedom, and Anita Peek, current executive director of the institute. The program, which is free and open to the public, takes place from 12:30 p.m. to 1:30 p.m. on Thursday, Jan. 15 in the Coolidge Auditorium of the Library’s Thomas Jefferson Building, 10 First St. S.E., Washington, D.C. Tickets are not needed. The Library of Congress in September 2014 became the new home of the collection, which is on loan for 10 years from the Howard G. Buffett Foundation. Elaine Eason Steele worked for more than 20 years for federal, state and local governments, rising from clerk to supervisor. In 1987, she co-founded with Rosa Parks the Rosa and Raymond Parks Institute for Self Development in honor of Mrs. Parks’ late husband Raymond (1903-1977). For many years as an executive assistant to Parks, Steele traveled with and coordinated all appearances by Mrs. Parks with leaders, heads of state and organizations throughout the world. She gained national recognition as the co-founder and developer of the Pathways to Freedom program. Ella McCall Haygan is co-director of the Washington DC/Metro Regional chapter of Pathways to Freedom’s Youth Program of the Rosa and Raymond Parks Institute for Self Development. Mrs. Parks’ Pathways to Freedom Youth Program offers an educational and historical research opportunity for students ages 11 to 17. Haygan also founded and runs a free social-services organization, From Streets to Skills Social Services on Wheels, to bring skills and services to youth, homeless families, former gang members and others in need. Anita Peek has served as the executive director of the Rosa and Raymond Parks Institute for Self Development since 1996. Under her leadership, the organization has grown to offer five separate programs, including the signature youth-development history expedition, Pathways to Freedom, and the Rosa L. Parks Learning Center, which specializes in intergenerational computer-based training. Blacks In Government ® (BIG) was established in 1975 to enable all present and future black employees in local, state and federal governments to have the ability to maximize their career opportunities and to provide a mechanism for inclusion, growth and advocacy. Incorporated in 1976, Blacks in Government is a national organization with chapters located in government agencies nationwide. Further information about the national BIG organization can be found at bignet.org. The Daniel A.P. Murray African American Culture Association of the Library of Congress was organized to increase awareness and appreciation of African-American culture, through educational, scholarly, cultural, benevolent, civic and nonprofit social activities. The association was founded by Sylvia Lyons Render in 1979. She was appointed as the first specialist in African-American history and culture in the Manuscript Division of the Library of Congress. 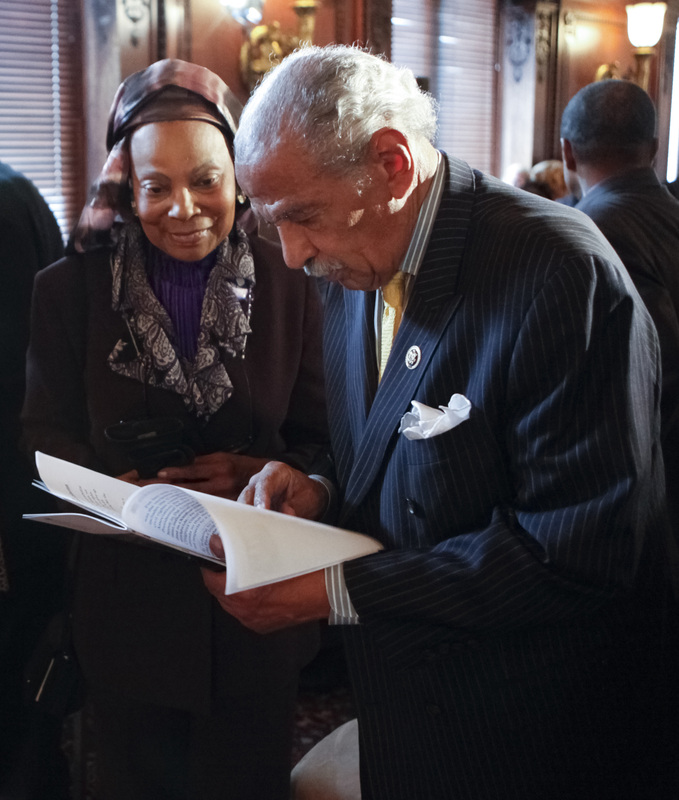 She was instrumental in augmenting the Library’s holdings in African-American history and culture. The Library of Congress, the nation’s oldest federal cultural institution and the largest library in the world, holds more than 158 million items in various languages, disciplines and formats. The Library serves the U.S. Congress and the nation both on-site in its reading rooms on Capitol Hill and through its website at www.loc.gov. As the nation marks historic anniveraries of the Emancipation Proclamation and the Macrch on Washington, Created Equal brings together four nationally-acclaimed documentary films on the long Civil Rights movement. Created Equal is part of the Bridging Cultures initiative of the National Endowment for the Huamnities, produced in partnership with the Gilder Lehrman Instititute of American History. In celebration of Mrs. Rosa Parks 102nd birthday, February 4th, 2015, The Freedom Riders film will be shown February 6th, 2015 from 6-9pm. The Rosa and Raymond Parks Institute will be hosting the film series being shown at the Charles H. Wright Museum all year. 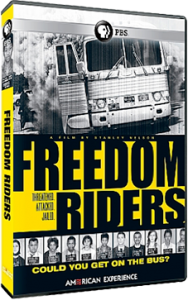 Freedom Riders tells the terrifying, moving, and suspenseful story of a time when white and balck volunteers riding a bus into the Deep South risked being jailed, beaten, or killed, as white local and state authorities ignored or encouraged violent attacks. 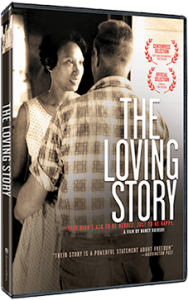 The Loving Story is about when Mildred and Richard Loving were arrested in July 1958, in Virginia, for violating a state law that banned marriage between people of different races, such laws had been on the bookd in most states since the seventeenth century. But the Lovings never expected to be woken up in their bedroom in the middle of the night and arrested. This brings to life the Lovings’ marriage and their legal battle. 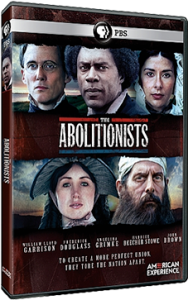 The Abolitionist vividly brings to life the struggle of men and women who led the battle to end slavery. William LLoyd Garrison a newspaper editor, Frederick Douglass a former slave, author and activist, Angelina Grinke, daughter of a rich South Carolina slaveholder, Harriet Beecher Stowe, author and John Brown, put faces on the anti-slavery movement in this three part series. 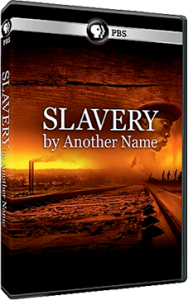 Slavery By Another Name tells the stories of men, charged with crimes like vagrancy, and often guilty of nothing, who were bought and sold, abused, and subject to sometimes deadly working conditions as unpaid convict labor. The films shows interviews with descendants of victims and perpetrators. The Rosa and Raymond Parks Institute wishes you a Joyful and Prosperous Holiday Season and may you have a Blessed 2015! Rosa and Raymond Parks Institute for Self Development, a non-profit 501(c) 3 organization, appreciates all donations provided. 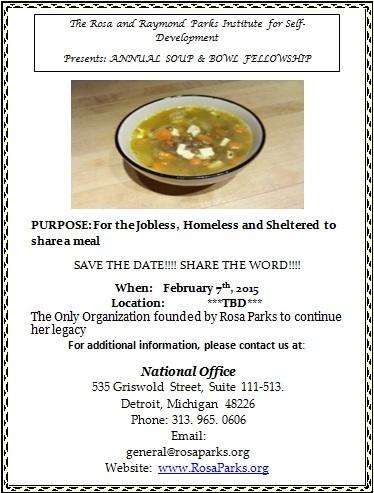 You may donate through our website: www.rosaparks.org and by clicking on our Donations Tab or mail your donation to the address listed below. Thank you for a great 2014 and we look forward to hearing from you soon. SAVE THESE DATES FOR 2015!